It didn’t take long. 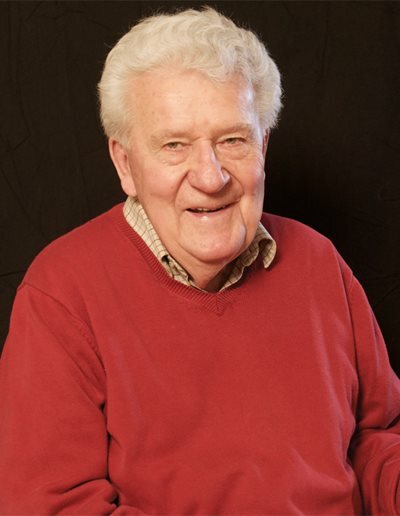 In the summer of 1947, at age 16, Eigeland convinced his skeptical parents to allow him and a friend to take a sabbatical from school to work aboard a merchant ship. The M/V Tricolor took the pair down the coast of Europe, across northern Africa, through the Suez Canal, along the Arabian Peninsula and on to India, the Philippines and China, ending in Shanghai. Back in Oslo, to keep his pact with his parents, he passed his school exams, but it wasn’t long until another ship job landed him in Canada where he worked in a gold mine, attended university and, in 1954, purchased his first camera, a Rolleiflex. In Mexico, he began writing and taking pictures for local magazines and public relations firms. Then, he recalls, he wanted a location where he could earn a living as a photojournalist. “I checked how many foreign correspondents and photographers of an international standard were based in Beirut, and I found there was a total lack. So I thought there’ll be lots of work if I go there. So I took another chance. In 1965, one encounter at the foreign press club introduced him to Paul Hoye, hired by Aramco the year before to edit Aramco World and establish its office in Beirut after 15 years in New York. Hoye gave Eigeland his first Aramco World assignment: a cover story on the centennial of the American University of Beirut. So began a 50-years-and-counting relationship with the magazine, which has sent him to more than two dozen countries over more than 50 assignments, 27 of which were cover stories and two of which were full issues that he shot and wrote. What follows are a few selected highlights of Tor Eigeland’s half century as witness to daily life for AramcoWorld. This assignment was certainly one of the most memorable in my life, even though the photos weren’t published until 2013, and then they became a book, too. 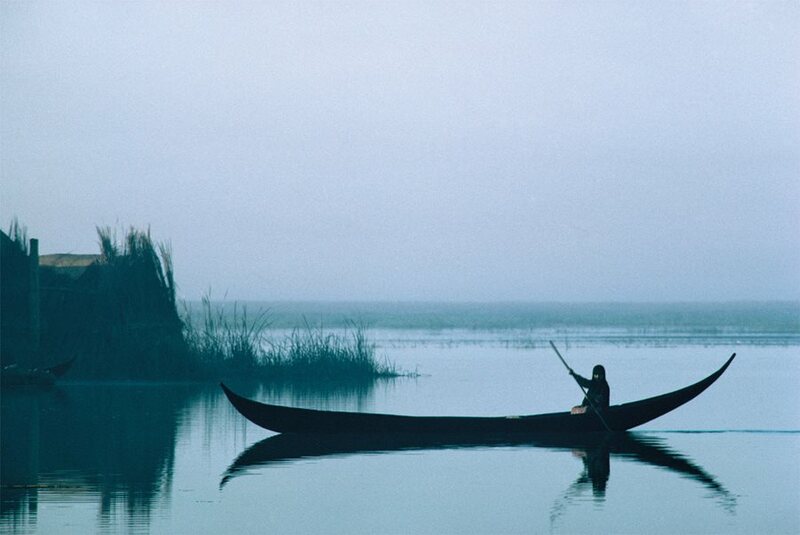 The Marsh Arabs lived in the central marshes of southern Iraq, between the Tigris and the Euphrates Rivers. A vast area of marshes. This particular photo—I remember taking it one morning, probably about four a.m. I was staying on a little island with some of these people. I saw this canoe just gliding by. I thought I was totally in another world 2,000 years ago. It was unreal. My whole experience there, I didn’t feel alien, but it was like living in a world totally, totally different from what I’d known before. A watery world, indeed. At the time, there were somewhere between 350,000 and half a million people living in the marshes. Their civilization was thousands of years old. They turned out to be extremely hospitable and fun-loving. Looking back on it, I think what has made it even more memorable is that this way of life is nearly extinct. 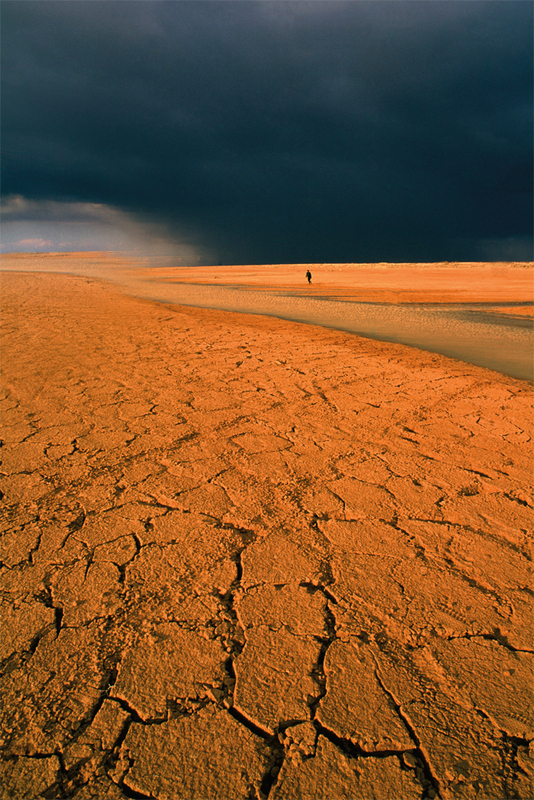 Saddam Hussein drained the marshes. The assignment was on Istanbul—an immense, lively city. You do a little research, and then you talk to some of the people there who really know the city. You find a driver who also really knows the city and sort of understands what you’re trying to do, so you make a plan and off you go in many different directions. This picture was not at all part of the plan. 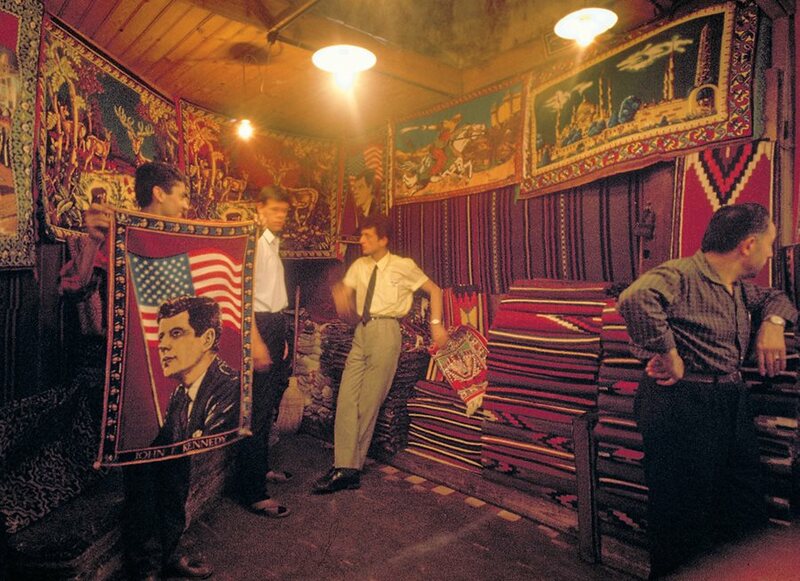 There was one carpet in the image of President John F. Kennedy. I was quite touched by that, that people in Istanbul would bother to do something like that. 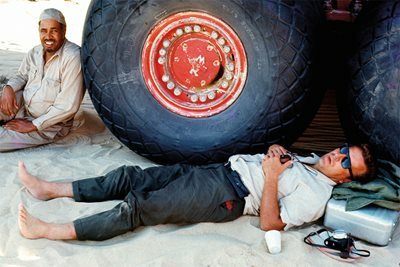 What I remember most was the incredible skill of the drivers in getting through or around the dunes. They were all Bedouin, born and bred and at home in this sandy world. I would have got stuck in five minutes. The other thing I remember from that trip was sleeping in the sand one night when there was a minor sandstorm. I must have been very tired as I slept right through the night. I woke up and, to my horror, I couldn’t move anything. Except for my head, my nose, I was buried in the sand. Panic is what I felt until one of the truck drivers spotted me and helped dig me out. Much relieved, I got dusted off and had a breakfast of sweet tea and bread with the drivers before we set off again. This was quite a large assignment involving a lot of travel. I have a very special relationship with Spain. The Spanish culture, way of life, is what attracted me to Spain. I love even the sound of the Spanish language. I find the Spanish a warm and lively people. Very approachable. And the food! Generally speaking, I’m sort of infamous for enjoying good food. I love Spanish food. When I was at university in Mexico, I specialized in Spanish and Latin American literature and philosophy, most of which I’ve forgotten. I developed a real desire to go live in Spain, and I did in 1970, for nearly 20 years. Another reason for moving to Spain was to get away from the tensions in Beirut and, also, life was much cheaper in Spain. I still feel very much at home in Spain. I don’t think I ever feel I have an assignment completely covered. I’m trying to think of a time when I did, but no. You always feel that there’s more. 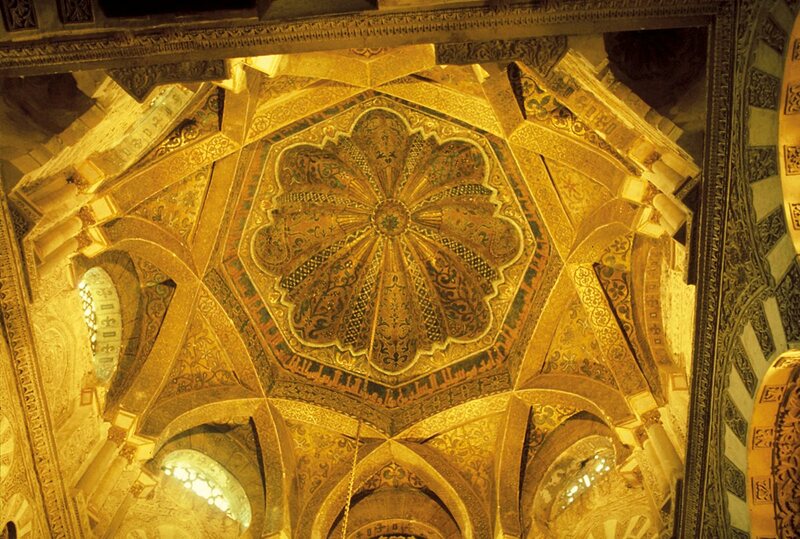 As part of the assignment on Islam in Al-Andalus, I found this particular dome, the one over the famous mihrab in the Great Mosque of Córdoba, incredibly beautiful. There was only one good way to photograph it, and that was to lie down on the floor. To the great surprise of the mob of tourists, I asked them to step aside, and I spent the next 15 minutes plonked down on my back trying to get this photo just right. This was the cover of the first whole issue I did for Aramco World. [Editor] Paul Hoye and I were talking about Saudi Arabia, and I said, “Well, I can do a whole issue for you on Saudi Arabia, Paul.” And that’s what happened. Then, of course, once I got into it, I thought this was completely mad. The big idea was to present a different picture of Saudi Arabia from what was in the news. There were so many positive things, culturally, historically, and that’s what I wanted to try and show people. I was amazed at how helpful everyone was. I must say everyone at Aramco in Saudi Arabia was extremely helpful. I couldn’t have done it without them. It was quite overwhelming, the challenge. When I sat down to start writing it, I felt completely swamped, overwhelmed. Endless tape recordings with a lot of my impressions. I spent endless hours transcribing it. You do it bit by bit, and the magazine came off in the end. I did a story on the tulip bulb industry, for which Holland is famous, because of course all those tulips originally came from Turkey. Being in Holland was logical at that time as Aramco World had moved there because of the civil war in Lebanon. 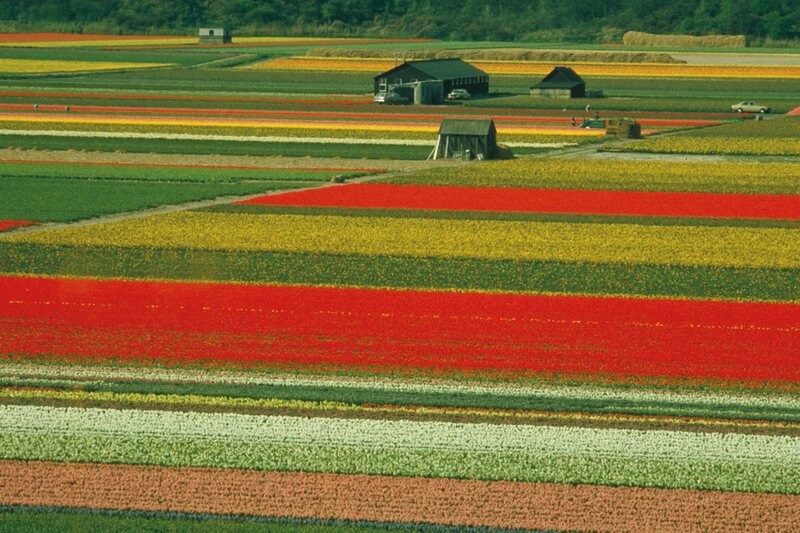 I rented an airplane and photographed tulip fields from where they looked like beautiful carpets. What I most remember from that assignment was flying and seeing these magical colorful patterns. Another thing I remember were the gardens called Keukenhof, where they display the most fantastic variety of tulips. In season it gets totally overrun by tourists, but one day I asked to come in before the gardens opened, and I spent some magical early hours with just the tulips and me. When you have to take fairly intimate people photos, you have to somehow put people at ease, which may take time, talking, laughing, showing an interest in the person, often telling him or her why you’re taking it. This lovely old guy does not in any sense typify Oman. 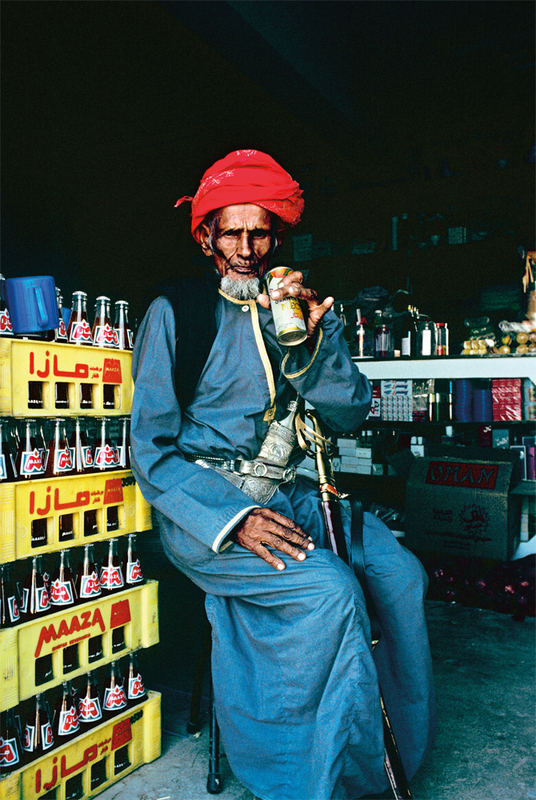 Oman is like many countries: It varies from one region to another. What typifies Oman now would be a much more modern sort of building, cars, luxury hotels, beautiful beaches, great agriculture. There are all kinds of quaint corners as well, and people of the old generation who look just as they did decades ago. I doubt that you would find someone there now looking like this. He’s in full regalia with a sword and the Omani dagger on him. The photo makes a nice point of something very traditional and then a shop full of Coke and Pepsi bottles, soft drinks. Old and new, indeed. This very much describes the difference between the first Oman image and a modern Oman. 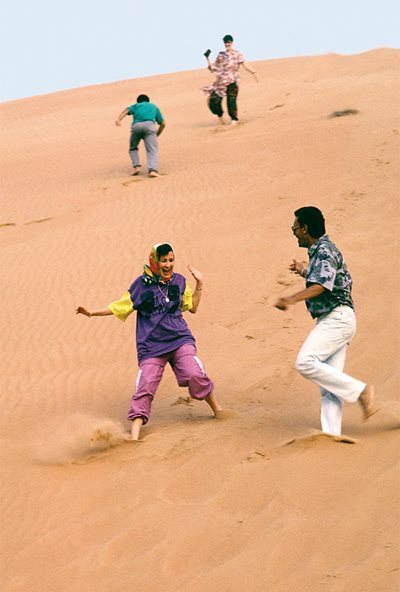 Here, tourists are having a great time in the Wahiba Desert, a beautiful area of virgin sands. These people are quite typical of what would be young Omani tourists. From the mountains to the sea and the city to the desert, it’s a beautiful country. Very well developed, wisely developed. Very friendly, hospitable. 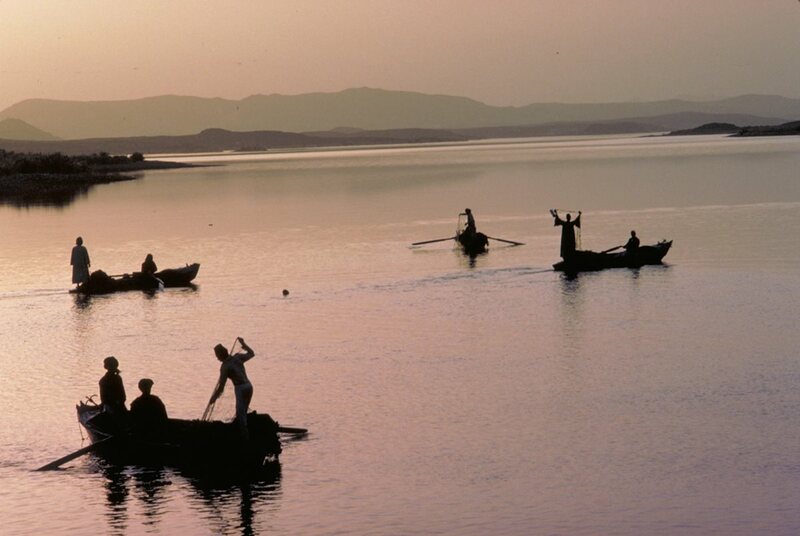 Nobody thinks of Egypt in terms of lakes, except for the Aswan High Dam and Lake Nasser, and the effects it has on the country and its agriculture. A lot of ill effects as well as good effects. That’s a book’s worth of information. The story was to tell the public about how many lakes really are in Egypt. What I remember best was the sheer beauty of many of them, as in this photo, which is actually one of my favorites. Coincidentally, the photo was taken almost exactly where in 1964 I photographed the workers closing the Nile, exactly the same place. By now there is a huge lake that reaches way into Sudan. This picture is very close to my heart. It was a story I had proposed about the Arab influence on Spanish food, which is great, especially in Andalucía. This photo captures quite a lot. 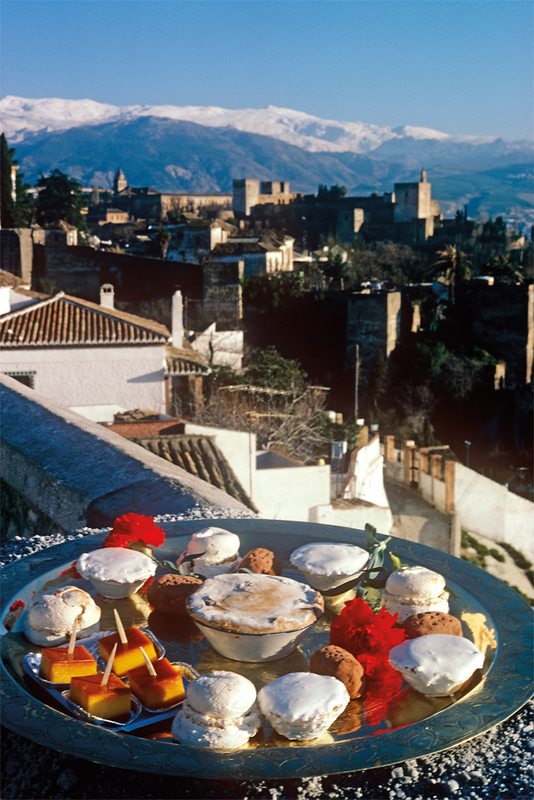 It shows snow-clad mountains in the background, the Alhambra and the Sierra Nevada. I spent several days with a food expert in Granada, whose specialty was precisely the traditional Andalucían sweets. Yes, a good part of this job was to taste this food all over Andalucía. That was a treat! The Silk Road story was pretty important. A landmark for the magazine, you might say. 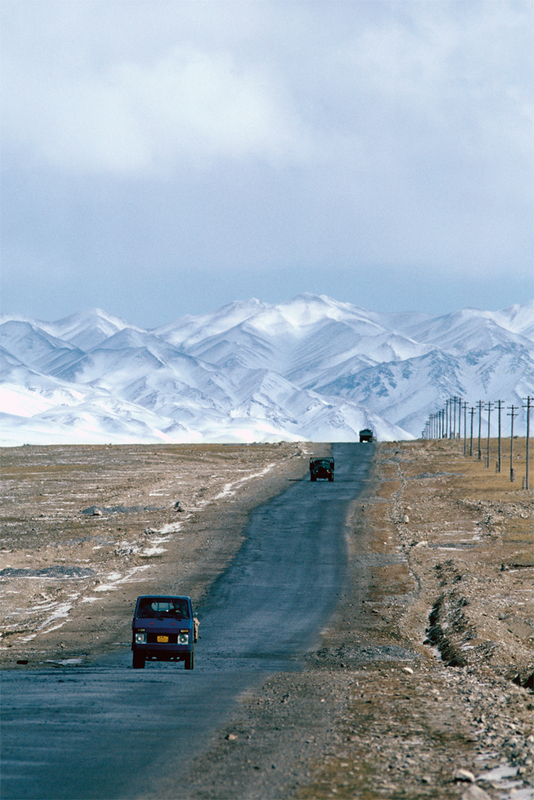 We were probably the first Western travelers to do the Silk Road all the way and mostly by land in a long, long time, because the borders were actually completely closed or semi-closed until a few years before. We traveled through what was then the Soviet Union and into what was a much more Communist China than it is now. It went much better than expected because proper permissions had been obtained. From Russia into China, there’s a sort of no-man’s land where nobody crossed, really, until then. We walked from a train station near the border with our luggage into China. Since this was the first time this kind of tourism had been allowed, there was a great reception with dragon dancing and banging of drums. We were welcomed there with open arms. That was all very smooth. We moved quite fast, so you don’t really have time to establish yourself in any one place, unless you have a year or two to do a trip like that. It’s more a matter of grabbing what you can than really establishing some kind of a relationship with a place or people. 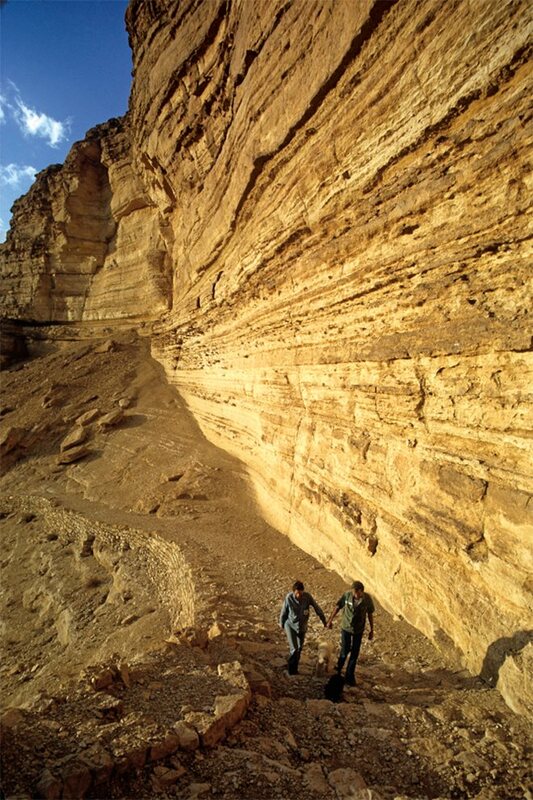 This is in Xinjiang, western China, populated by tribesmen around Kashgar. A lot of these people can seem almost like they live on horseback. 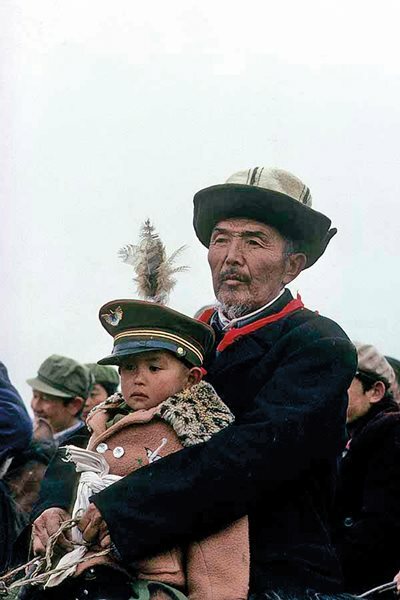 This photo, of an older man with probably his grandson with a Chinese uniform hat—I very well remember. There were horse races and also something like a polo match with a goat’s head or something like that, which they pick up and sling around. In fact, very exciting. I also remember the crowd. It had got so heated up that there were Chinese policemen there, not very well liked by the locals. The police in the end asked us to leave because it was getting so heated they thought there might be a fight. 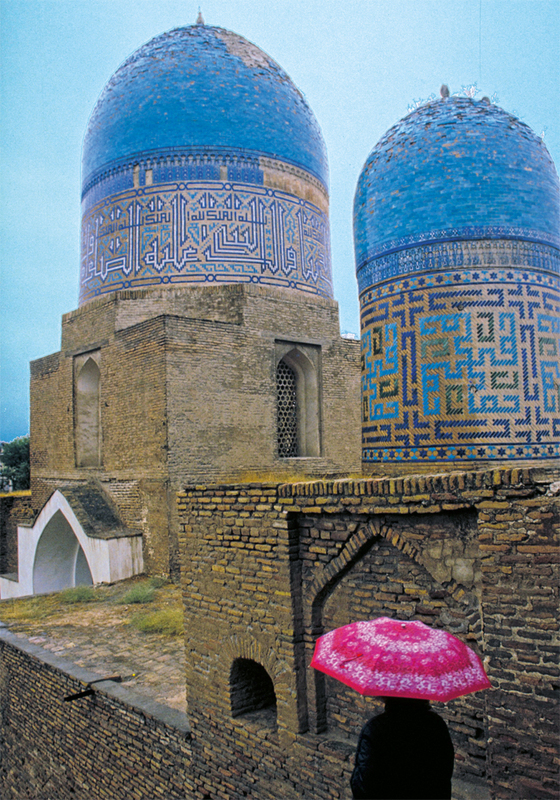 This photo was taken in Samarkand. What is most remarkable about this photo, to me, is that it was taken in the rain in a place where it almost never rains. In fact, I was told generally, in that area, my photos were remarkable mostly because it was raining. Umbrellas where you never see umbrellas. It was a special moment on a very, very long trip full of excitement, pleasures and lots of difficulty as well. I did this assignment with John Lawton. Old friend, great journalist. If you want to find out whether somebody is a friend or not, undertake a trip. If you come out as friends, still good friends decades later, you’re really good friends. 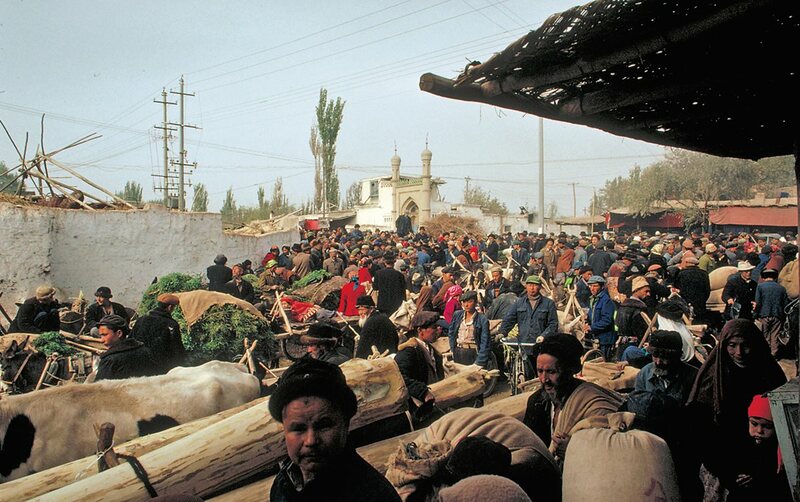 This is a market in Kashgar, in western China. That was really like being in another world. No time to really establish any relationships with anybody. You had a day to do it. You go to the market, and you get pushed around by the immense crowd. Everybody’s friendly, no hostility whatsoever, but still it’s a matter of grabbing what photos you can, when you can. Language there is a real challenge. If you speak Chinese, that’s no use because the local people speak Uighur. My greatest memory was being out in the Badia—that’s what they call the great eastern desert there—with a Jordanian guide looking for I don’t remember what. In the distance, you can see a tremendous storm, a black cloud, which was full of lightning. We were quite far from the camp. I remember thinking, “If that storm hits us now, we’re completely stuck.” We were not in a four-wheel drive, just a pickup. We would really have been stuck. There was a moment of seeing one of the most beautiful desert scenes I had ever observed and photographing it and worrying about getting back in the car and getting out of there. I think I am an off-the-beaten-track person. So when the Spanish government set up travel routes in Andalucía, it was an ideal assignment. I was living outside Barcelona, and I was given freedom and time to explore places that were not so obvious. This photo was taken in the small village of Pampaneira in the Alpujarras, a mountainous region in the province of Granada. 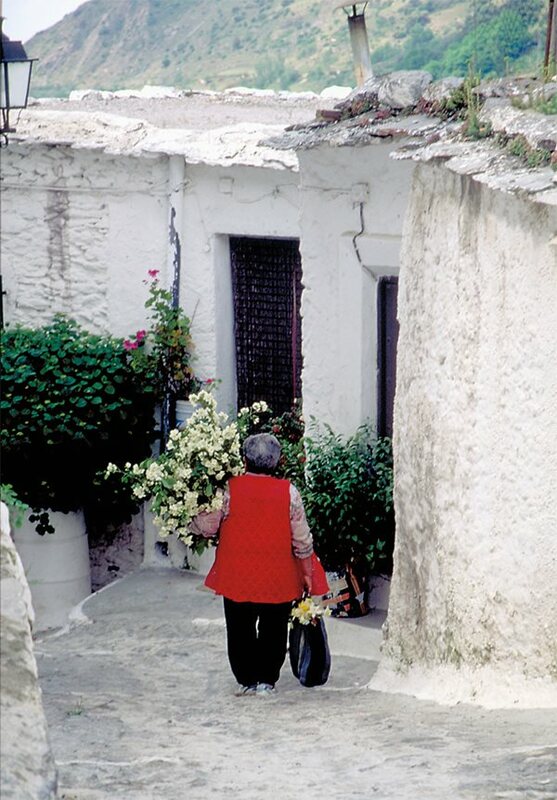 Here, the same place where the Moors held out long after they were expelled from Spain, a woman walks home with flowers. This was shot in Brunei, which is a tiny country on the big island of Borneo. It’s in the most virgin of virgin rainforests. 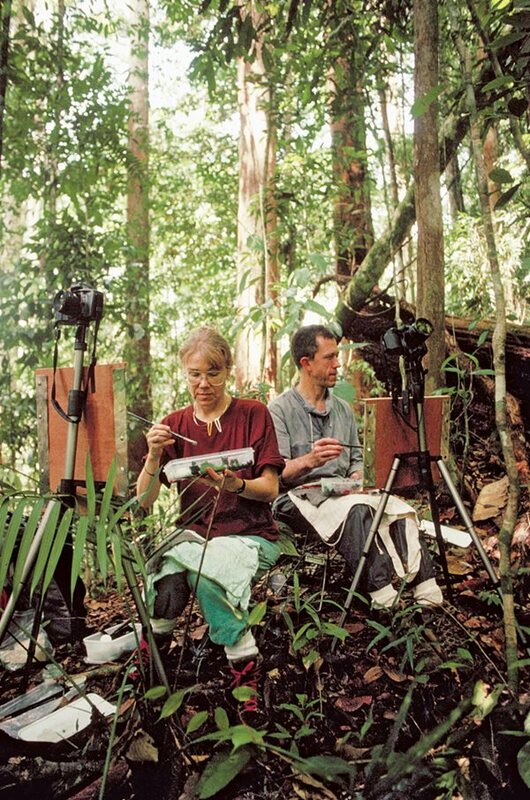 The photo is of two scientist-painters who are just painting details of things they see. Definitely not a place where you’d wander off by yourself. I knew that in this area there were more snakes per square meter or kilometer than anywhere else in the world. The whole time I was there I was looking for snakes. Not only because I wanted to see one, but you never know what snakes can do to you. I never saw even the tail of a snake. I think I was there for a week. The man who was most helpful to me there was a very experienced Danish botanist; Carl Hansen was his name. He showed me some plants and interesting things. Hansen wandered off on his own, being very experienced, up to a hilltop perhaps a mile or so away. He knew the route very well, but he got caught by the dark. Of course, there’s no way you can work your way back through dense rainforest in the dark. He stayed there overnight. But in the rainforest, it rains. Hansen got good and wet. What he was bitten by, I don’t know. It was nothing like snake bites. He came back to the camp feeling very bad. A nurse in the camp tried to take care of him. I actually left the next day, but found out before I had left Brunei that he was helicoptered to a hospital and died there. 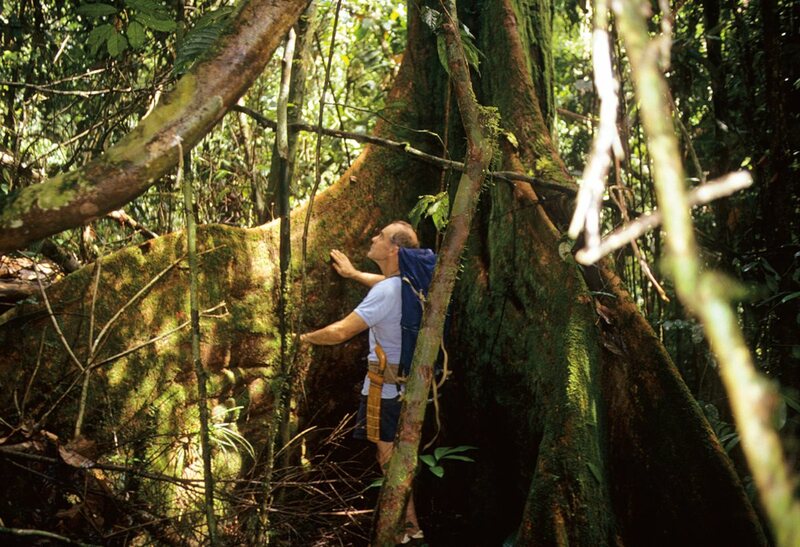 From the experience in the rainforest, Hansen himself is what I probably remember best. He was a kind and gentle professional botanist, and I became quite fond of him. Also, he was the only one there who went out of his way to help me do my job. I realized that I’d taken the last photos of him alive, and I got in touch with his wife and sent her two or three really good photos of him working in the rainforest. Getting off the autoroute, taking the old roads, there are a lot of beautiful little towns, full of little inns and restaurants and interesting things to see all the way. This particular photo, it’s a sort of a spoof on the little terrace. 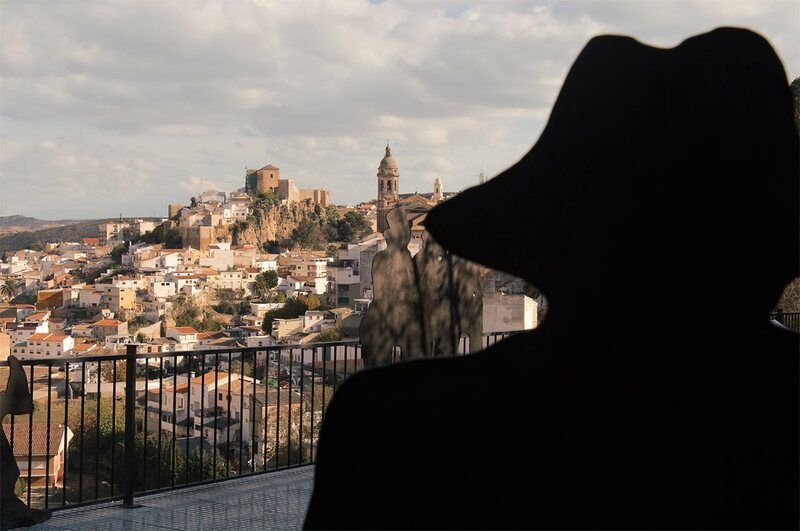 Somebody made black figures, looking like real people, out of some kind of a black boards, so what you see is a silhouette of a person and the ancient town of Loja in the background. I think the most memorable thing about this trip was seeing the room where Washington Irving lived in the Alhambra. It’s not open to the public, at least it wasn’t then, and there’s not much in it. It’s just a little corner of the Alhambra, where I’d been many times, but that I had not seen before. A friend and colleague by the name of Alia Yunis wrote this story about the best chocolate factory in Damascus, which also happens to be one of the best in the whole world. It was extremely memorable for many reasons. Back to my stomach slightly, it’s the best chocolate I’ve ever eaten. 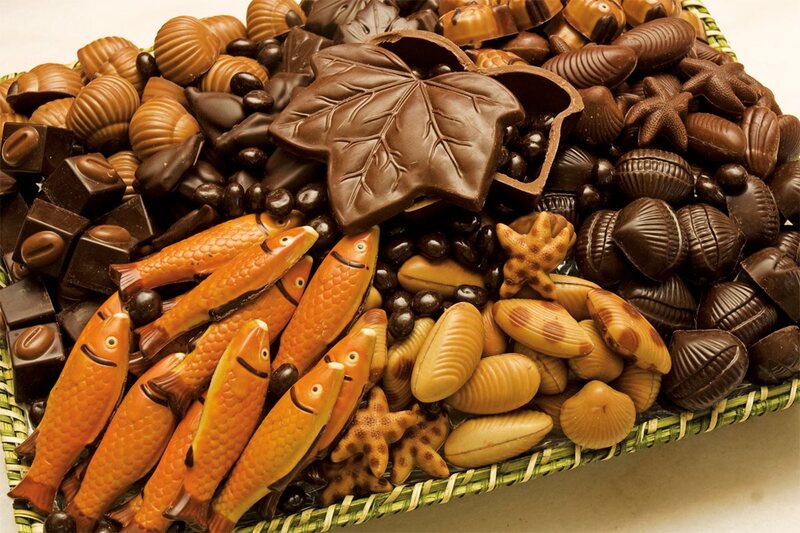 I became friendly with the owner, Bassam Ghraoui, and for several years afterward, at Christmas, to my vast surprise, I’d get a box of chocolates. What made it more poignant, I guess that is the word, was what has happened to Syria and all the good people I met since then. I think you feel a disaster like that a lot more strongly if you know the place, and you know the people, and you know how nice they are. I phoned them about a year ago. The main factory closed down because it’s part of a war zone, but they were still producing some chocolate in sort of a protected area of the Damascus. Whether they’re still there or not, I don’t know, but if they ever see or hear this, God bless them. My latest assignment was in Tangier last year, but this photo had nothing to do with the story. It happens to be a main square in Tangier where I took a break from work, and I sat there and had lunch and put a camera on my table, and occasionally as something interesting passed by, I would just click the shutter. I wasn’t looking through a viewfinder or anything like that. I just propped the camera on the table. I think if this photo works, it’s simply because it shows everyday life. 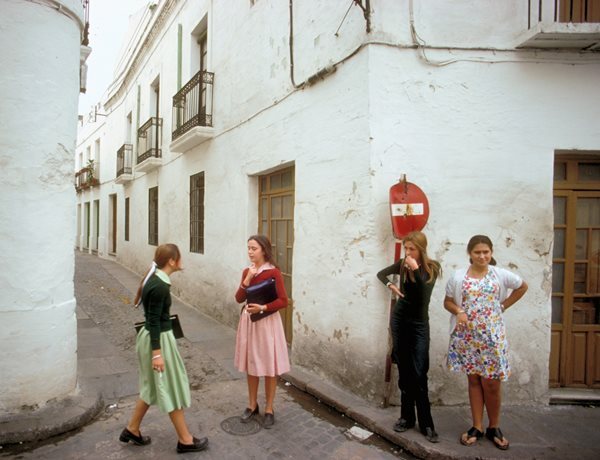 A typical, normal scene in Tangier, typically Moroccan. My assignment was at the American Legation in Tangier, and part of that was to photograph classes in reading, writing, Moroccan cuisine and handicrafts for Moroccan women. The Legation was originally a diplomatic mission, and now it’s partly a museum, partly a center of Moroccan studies. For me, the most interesting part, which was really most of my story, was on how, sponsored by the institution, Moroccans are teaching Moroccans literacy, Moroccan arts and crafts, and Moroccan cuisine. 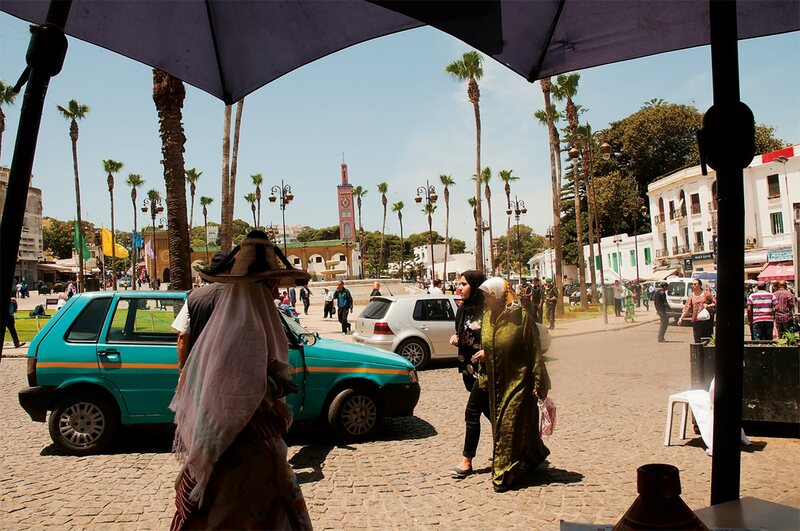 I had not been back to North Africa for some time, but the moment I arrived in Tangier, I realized strongly how much I had missed that part of the world. I was happy to be back. I felt at home, and people made me feel at home. On the first day, I visited the different classes and their teachers, introducing myself and gently taking a few photos, always asking permission when it seemed appropriate. The classes were fascinating to observe, and gradually I grew closer to the subject, and more and more I found that the women accepted me and were quite happy and proud to be photographed. On my last day, I photographed a lively cooking class with some 12 women. The atmosphere was great; the ladies were very helpful in the sense that they just let me get on with my often close-in photography as if I were not there. A most extraordinary thing happened when I was about to leave. I packed my camera bag, then simply addressed the class, expressing my thanks for their helpfulness and excellent baking. To my astonishment, as I walked out the door, one of the women started clapping her hands. I turned around and suddenly they were all clapping. A touching and unique moment. I realized that something special had happened. It was perhaps the most special of all my memories from all those years of traveling. As it happens, at age 85, it may have been a fitting farewell for what may have been my last assignment for AramcoWorld. All articles photographed and written by Tor Eigeland are searchable at aramcoworld.com. 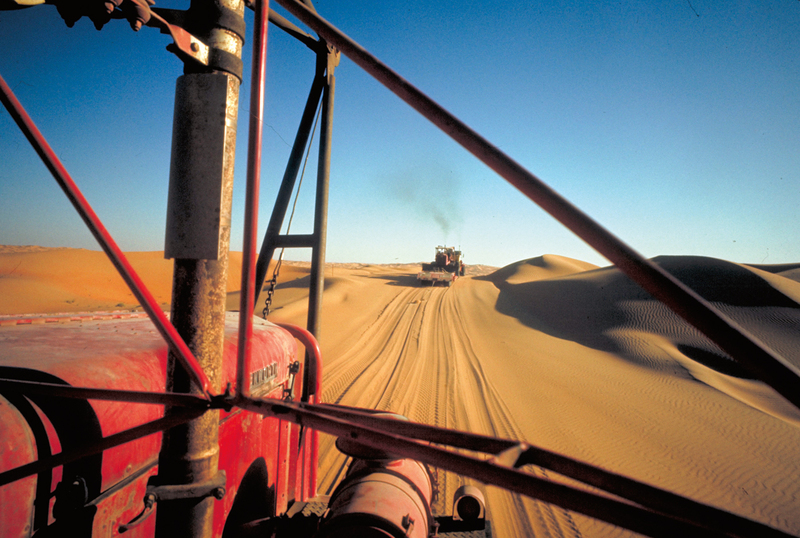 Norwegian-born Tor Eigeland has traveled all his life as a freelance writer and photographer, and he has contributed for decades to AramcoWorld as well as to many other publications. Jeroen Wolf is based in Amsterdam and worked as a print journalist and television researcher for Dutch Public Broadcasting until he founded his own video production company in 2003. He specializes in documentary work.